We have driven the High Road from Taos to Santa Fe countless times. 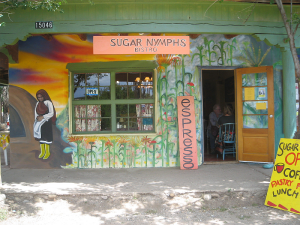 We have sped past Peñasco’s Sugar Nymphs Bistro and not stopped for reasons that now seem stupid. Jane, the ever-determined one, set her sights on this place even before we left Taos for home. That it was open on a Tuesday (normally closed), we took as an omen. Lucky us. The bistro share a building with the Peñasco Theater. The Peñasco Theatre Collective, based out of the historic Peñasco Theatre, runs arts and social justice programming in the Peñasco, Espanola, Taos, and surrounding communities north of Santa Fe. 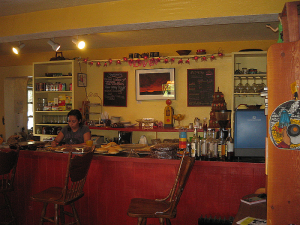 Established in 2000, it is a project of nonprofit organizations Wise Fool New Mexico and Art for the Heart. 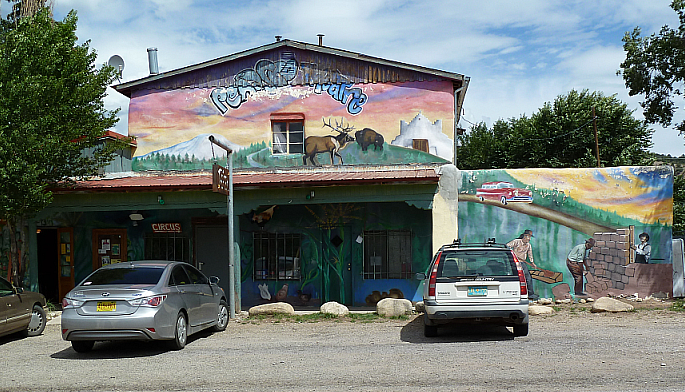 Peñasco, New Mexico is a beautiful small rural mountain town, population 700. The majority of its residents are Native and Hispano peoples whose families have lived and farmed here for generations. Peñasco Theatre Collective’s low- or no-cost programming, including workshops, performances, projects in regional schools, and community events, provides the local community with opportunities to experience and participate in the creative process. A variety of artistic mediums are taught and performed, including aerials (trapeze, rope, hoop, fabric), physical theatre (clowning, juggling, acrobalance), poetry, visual art (painting, puppet-making, fabric arts), and dance (flamenco, hip-hop and other movement-based disciplines). Utilizing the arts, their professional artist/teachers collaborate with young people to create unique opportunities for self-discovery, physical development, personal and collective empowerment, youth visibility and inter-generational connection. 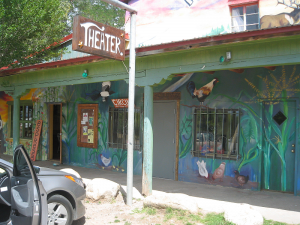 The theatre was built as a community gathering place in 1940, and they are carrying on the tradition. The restaurant is small and comfy with perhaps seven -nine tables (depending on how many are pushed together foe larger parties). The walls are adorned with local art. The menu is small. The lunch menu contains standard sounding stuff (salads, burgers, quesadillas, sandwiches, and the like. Don’t let that put you off. Each item is close to masterpiece quality. 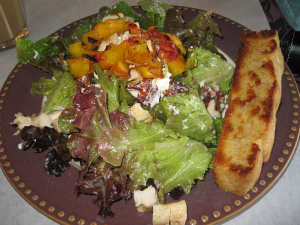 Jane ordered a Grilled Peach Salad—Warm Peaches, Grilled Chicken Breast, Local Lettuces, Toasted Pecans and Goat Cheese tossed in Ginger Vinaigrette. No ordinary salad this. Blew her away. It is served with a hunk of house-baked focaccia that will change your mind about what focaccia should be like. I wanted to steal it from her plate when she wasn’t looking. You may have had peaches in a salad before, but never like these. Fabulous. And whatever you get, make sure it has goat cheese along with it. I really wanted to try a green chile cheeseburger (I am known as a GCCB freak), but my diet told me to try the Steak Quesadilla. I am not normally a quesadilla fan, but a vioce in my head said to try this. Steak Quesadilla—Grilled Skirt Steak, BBQ Sauce, Onions Cilantro, Cheddar and Jack Cheeses in Crispy Flour Tortillas, Served with Salad dressed with a superb ginger-sesame dressing. Outstanding salad. But the quesadilla was like four crispy slices from heaven. The thin-sliced skirt steak was perfectly done. There was a small dish of house-made salsa with the plate, and it was vet fresh and tasty, complementing the gently crisped flour tortillas that housed the meat and cheese. 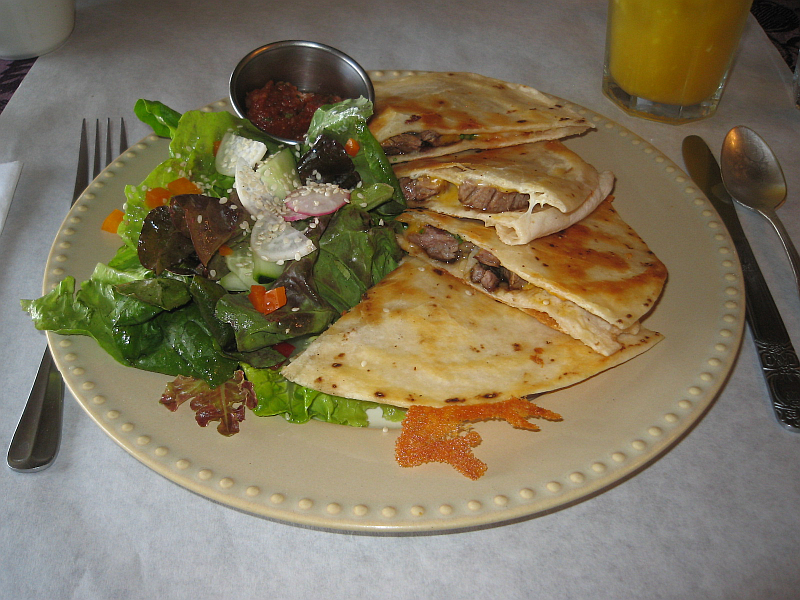 I may never have quesadillas anywhere else because they will suffer by comparison to the Bistro’s. 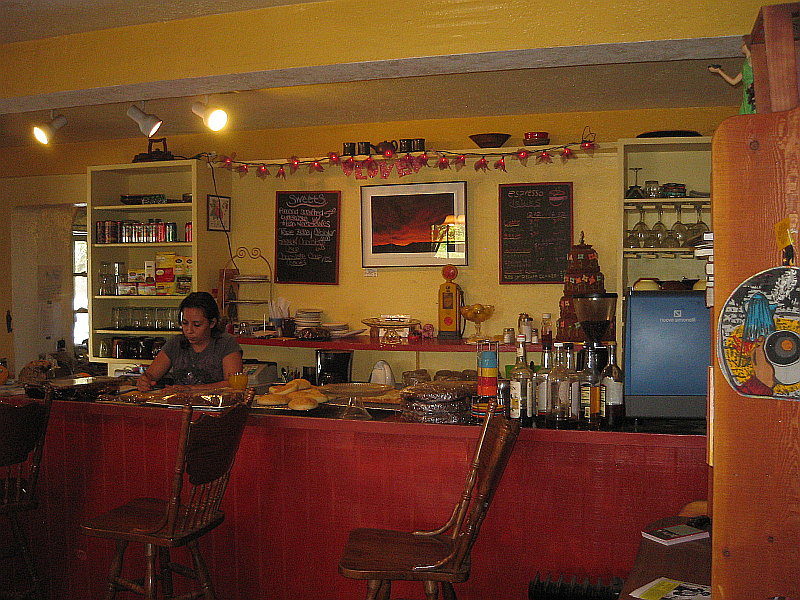 Look at the baked goods displayed on the counter. Drool. Wish you weren’t on a diet. For Sunday brunch, you get complimentary scones that are said to put all others to shame. I believe it. I asked our friendly servers for a little cup of green chile as a preview of the GCCB that I will probably order next visit. Smoky, tasty, and medium-hot piquancy. The GCCB will be really good. I’ll let you know. 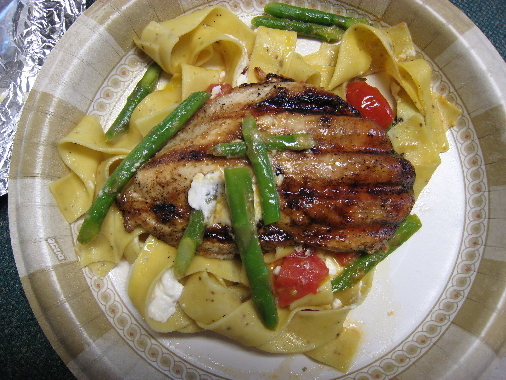 My friend Gil Garduño has written about dishes on the dinner menu. Raves. Read his review linked below. I guess we need to make a separate trip. Taos is, to me, somewhat of a culinary wasteland with its many wannabees that are mere touristy formula joints. Nonetheless, three outstanding eateries come to mind: Lambert’s, Dragonfly Cafe, and Orlando’s. I can now add Sugar Nymphs Bistro to that distinguished list, even though it’s a thirty-five minute drive from the Taos Plaza. Absolutely worth the drive. Do it. 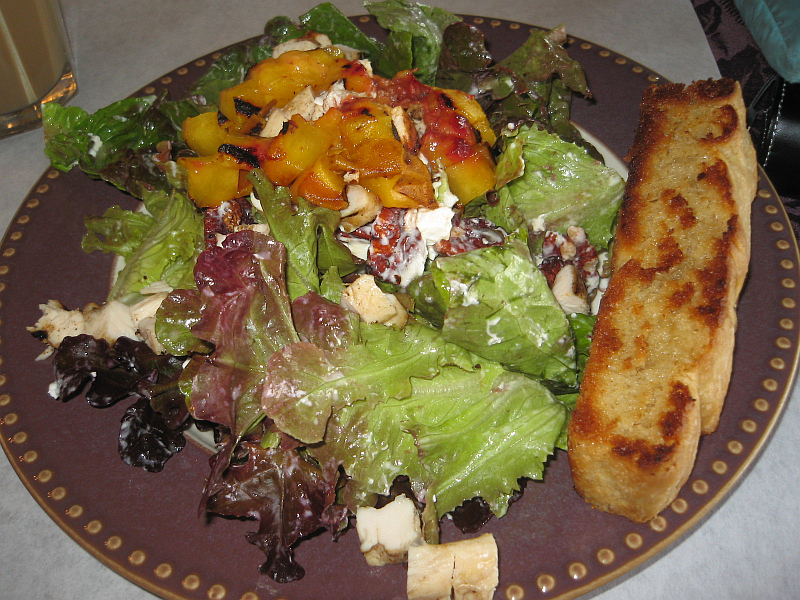 And get goat cheese on something. “Peñasco has always been the beautiful stepsister ignored by the dutiful suitors who prefer the company of its more glamorous sibling Taos, the mystical art colony to which new age subscribers seem preternaturally drawn. Sugar Nymphs Bistro is starting to lure some of those suitors away. 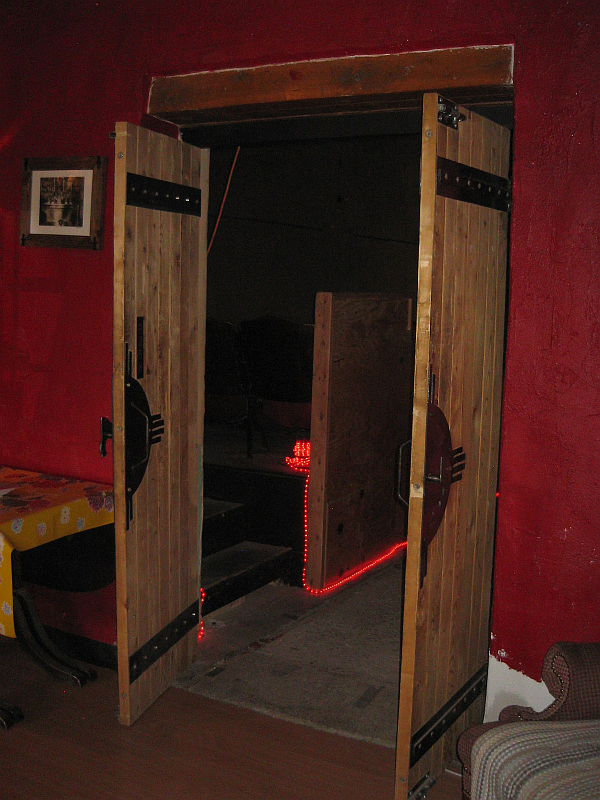 This entry was posted in New Mexican, Peñasco, Taos. Bookmark the permalink. Thank you Larry for you dazzling commentary about our food and the Penasco theatre, we really appreciate it and the wonderful photos…next time you come in please introduce yourself and we’ll take the calories out of the Carrot Cake for you! Carrot cake is my second favorite dessert. Bread pudding tops it (barely). 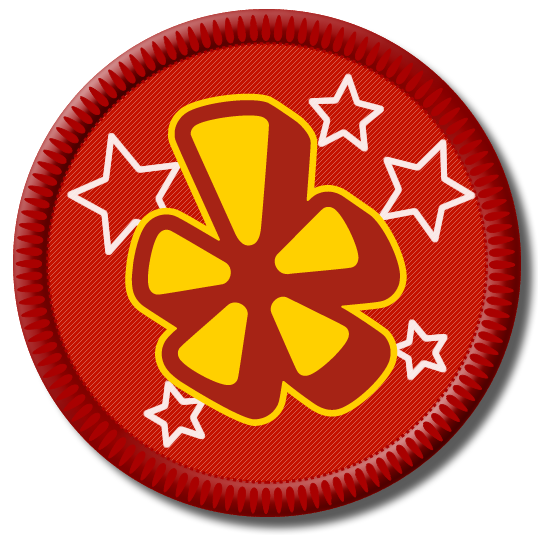 Thanks for adding a link to my blog on your Web page (reviews). I’ll be sure to stop by on my next trip to Taos. AWESOME, we have enjoyed SN twice and will go again!